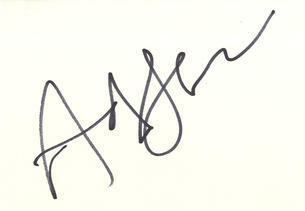 This is an In Person signed 5.5" x 4" white card by the English actor. Andrew Clement "Andy" Serkis (born 20 April 1964) is an English film actor, director and author. He is best known for his performance capture roles comprising motion capture acting, animation and voice work for such computer-generated characters as Gollum in The Lord of the Rings film trilogy (2001–2003) and The Hobbit: An Unexpected Journey(2012), the eponymous King Kong in the 2005 film, Caesar in Rise of the Planet of the Apes (2011) and Dawn of the Planet of the Apes (2014), Captain Haddock / Sir Francis Haddock in Steven Spielberg's The Adventures of Tintin (2011) and Supreme Leader Snoke in Star Wars: The Force Awakens. Upcoming motion capture roles include Supreme Leader Snoke in Star Wars Episode VIII (2017), Caesar in War for the Planet of the Apes (2017), and Baloo in Jungle Book: Origins (2017). Serkis' film work in motion capture has been critically acclaimed, and he has been called the "godfather of motion capture". Serkis has received an Empire Award, a National Board of Review Award, two Saturn Awards and a Screen Actors Guild Award for his motion-capture work. Serkis also earned a Golden Globe Award nomination for his portrayal of serial killer Ian Brady in the British television film Longford (2006) and was nominated for a BAFTA Award for his portrayal of new wave and punk rock musician Ian Dury in the biopicSex & Drugs & Rock & Roll (2010). In 2015, he had a small role in Avengers: Age of Ultron. Serkis has his own motion capture workshop, The Imaginarium Studios in London, which he will use for his directing debut, Jungle Book: Origins.